We need more established companies in America that are a bit more willing to try new things, even if they do seem a bit crazy. Just think about the publicity they would get even if the new product turns out to be horrible. They say there’s no such thing as bad publicity. Take Pizza Hut Japan for example. Yes, you are looking at a pizza with pigs in a blanket for the crust. Talk about customization. Half of the pizza is pepperoni and veggies with a cheese-filled popper crust (that I believe we did have here in the states at one time. 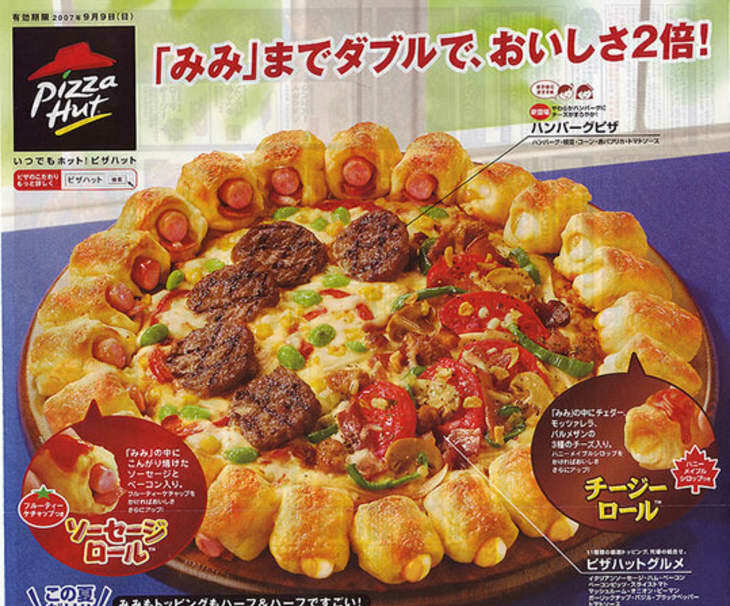 The other half is uniquely Japanese with hot dog stuffed crust and what looks to be grilled sausage. This is a Pizza Hut flyer from last summer, so those of you in Japan now won’t find it on a menu. But wouldn’t you like to see this sort of experimentation in your country?